We all face daily challenges that tug at how we spend the dear time that is given to us. All anglers and outdoor enthusiasts know how hard it is to follow their favorite pursuits. Summer is fleeting, make time. Rain, rain, go away! The recent deluge in the Chesapeake Bay watershed has dropped more than 6 inches of rain in many places. On a positive note, the storms have cooled bay waters 3 to 5 degrees to 78 degrees, while we’re seeing a recharging of oxygen to more of the water column. This will allow cool water-seeking gamefish more places to travel, and provide them some temporary relief from the stressful pre-storm conditions. On the flip side, these heavy rains will quickly cloud bay waters with muddy runoff and in some cases, floating debris. Maryland Department of Natural Resources monitoring crews are on the water this week to capture post-event conditions, and we’ll report on them next week. There will be above-average tidal currents all week as a result of the upcoming full moon July 28. Striped bass continue to be corralled at the upper bay shoals in the general area of Swans Point north to Pooles Island and the water quality situation is not getting any better for striped bass. Low dissolved oxygen levels in deeper parts of the bay have driven them on these shoal areas where the salinity is low, dissolved oxygen is minimal and water temperatures approach the upper limits that they can tolerate. Generally speaking this is a trauma trifecta for the striped bass. The fishing has been good for those chumming and chunking, and many anglers report that setting up a chum slick is not necessary, since the fish are so concentrated in a small area. Unfortunately in these conditions, catch-and-release stress mortalities and skin lesions will become more common. Anglers are urged to release all striped bass in the water and not to handle them out of the water. Anglers should keep releases at a minimum and not practice catch-and-release after collecting their two-fish limit. Channel catfish are very common in the area and baits that rest on the bottom will certainly catch their attention. There is a little bit of trolling action for striped bass near the shoal areas and the mouths of the region’s tidal rivers. Action tends to be best in the early morning; the shallower areas offer the best opportunities, and gold spoons and chartreuse bucktails tend to be a favorite. Runoff from recent rain will cause stained waters. There continues to be some striped bass action near the mouth of the Patapsco for those jigging, trolling or drifting near structure. The Conowingo Dam will experience large water releases due to runoff coming down the Susquehanna from Pennsylvania and daytime power generation. There continues to be a good shallow water striped bass bite in the area of the Susquehanna Flats and surrounding shorelines. Topwater lures tend to be a favorite and most will agree the action is over once the sun clears the horizon. Fishing for white perch in the tidal rivers has been very good and is being enjoyed by those casting small lures along shorelines in the early morning and late evening hours. Small spinnerbaits, spinners and jigs tend to be favorite choices. In deeper waters, bloodworms, grass shrimp or peeler crab are good choices to use on a bottom rig. The size grade of the white perch is exceptional this year. There continues to be good fishing for striped bass at Bay Bridge piers and recently the rock piles. The striped bass tend to be suspended at 15 to 20 feet and can be caught by chumming, chunking, live lining or jigging. The best striped bass fishing near the piers tends to be on the eastern side of the bridge in about 16 feet of water. The western side of the bridge is holding white perch in about 15 feet. Striped bass fishing tends to be overshadowed by the action in the upper bay but there are some local opportunities. At some shallower edges at Thomas Point and the Diamonds at the mouth of the Choptank there is some early morning chumming and live lining action. The edge off Tilghman Point in Eastern Bay has been another spot to check. There are places like this all over the middle bay region, where striped bass are moving up into the shallows looking for something to eat and then retreating to waters as deep as suitable dissolved oxygen levels allow them to go – usually around 15 feet. Trolling can be an option near the mouths of the tidal rivers along the shallower edges in the early morning. Bucktails dressed with sassy shads, gold spoons and diving crankbaits have been good choices to troll with. The early morning shallow water striped bass fishery continues to be a good way to get in some light tackle striped bass action. This fishery usually shuts down when the sun cracks the horizon so it means getting out there before dawn. Topwater lures remain one of the more fun ways to fish but swimbaits and crankbaits can also be effective. Fishing for white perch has been good in the tidal rivers of the middle bay region and the grade of perch has been very nice. Casting small lures with light tackle in the early morning and late evening hours along shoreline structure has been a great way to catch a mess of perch. Fishing with grass shrimp, bloodworms or peeler crab in deeper waters near docks and oyster bottom has also been good. Spot can be found in the lower Choptank River on hard bottom inside of Black Walnut Point, in Eastern Bay and in the Little Choptank. 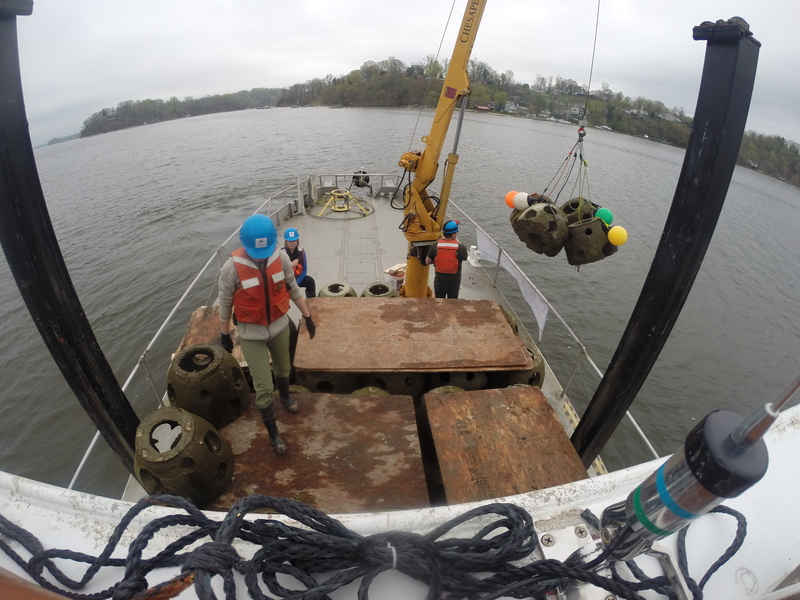 Photo by Alison Colden, Chesapeake Bay Foundation. The Chesapeake Bay Foundation and their partners, including the department’s Maryland Artificial Reef Initiative, have launched a volunteer anglers’ survey/tournament at the “Winchester Lump” experimental reef ball site in the Severn River. The tournament is free and is underway, running from from July 15 to Nov. 1, with bi-weekly prize drawings, overall prizes and special awards for first fish and most trips logged. 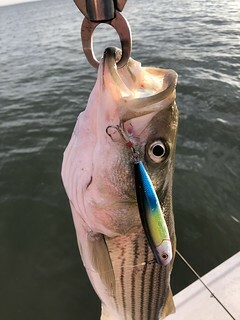 Chumming for striped bass has been steadily improving at the rock piles north of Point Lookout and the mouth of the Potomac River. The channel edge extending from St. Clements down past St. George Island has also been a great place to chum or live line spot. Spot are fairly plentiful now in the lower Patuxent and St. Mary’s River, so live lining spot is a great alternative to chumming. Small bluefish are beginning to show up in the region and attracted by chum slicks. 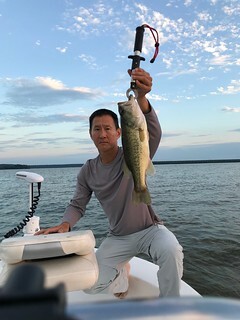 Casting topwater lures and crankbaits near shoreline structure in the early morning and late evening has been a great way to fish for striped bass. The best opportunities are in the early morning hours before the sun rises above the horizon. The lower Patuxent and St Mary’s rivers are two of the best places to try shallow water casting on the western side of the bay. Fishing for large white perch in these same areas has been very good for those using a variety of small lures. 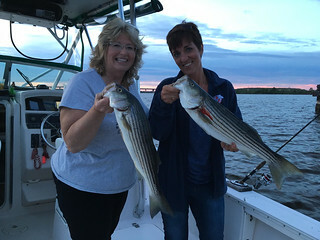 On the eastern side of the bay from Hoopers Island south to Pocomoke Sound there is a minimal amount of shallow water striped bass being caught that are over 19 inches, but most are coming up short. A few speckled trout and small bluefish can be part of the mix at times. 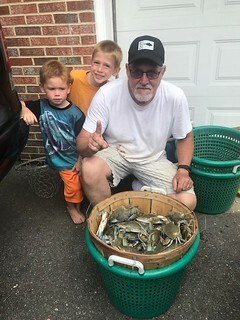 Jim Livingston shows off a nice bushel of crabs he caught in the middle bay region while his grandchildren ham it up behind him. Photo courtesy of Jim Livingston. Bottom fishing for a mix of croaker and spot has been good in the lower Patuxent River and the Cornfield Harbor areas. A little farther up the Patuxent, fishing for white perch has been good over some of the deeper oyster bars. Blue catfish will always be part of the mix. Fishing for a mix of croaker, spot and white perch has been good from Hoopers Island to Pocomoke Sound. Bloodworms have been the best bait for catching spot and peeler crab baits work well for croaker and white perch. Small bluefish are becoming more common and flounder can be found at times along hard channel edges. There have been a few reports of cobia being caught near the Target Ship by those chumming, but the most steady cobia action remains below Smith Point. A few Spanish mackerel are being caught by those trolling small silver spoons near Smith Point and large red drum have been seen near the Middle Grounds. Recreational crabbing continues to pick up speed in all three regions of Chesapeake Bay. In the upper bay anticipated catches have gone from zero to being able to catch a few dozen to a half bushel of crabs. In the middle bay region most are able to catch a full bushel per outing and the very best crabbing has been occurring in the lower bay’s tidal rivers and creeks. Fresh chicken necks have been a good bait to use in collapsible crab traps and trot lines and razor clams continue to reign supreme as the best bait. Fishermen in the western region have been finding relief from the oppressive summer heat by taking to their favorite waters to try a little fishing. The higher water conditions and warm water temperatures have made for some interesting fishing conditions on the many trout streams in the region. Fly fishermen have been enjoying finesse fishing with light fly tackle. Anglers at Deep Creek Lake are catching largemouth bass in the grass beds in the deeper cove areas in the early morning and late evening. Buzzbaits and poppers are good topwater lures for this type of fishing right in the grass. Largemouth and smallmouth bass are going for shade and cool water temperatures during the heat of the day. This means deeper waters and the shade of a floating dock or over hanging tree. Anglers try to make it as easy as they can for these lounging bass and will often use a wacky rigged plastic worm and twitch it right in front of their face. Recent rains in the region predict the upper Potomac River to crest at about 7 inches, so fishing on the upper Potomac could be dangerous. More rain is expected so conditions could even be more severe by the end of the week. Largemouth bass are reacting to the summer heat much like we do and are most active during the cooler parts of the nights and tend to conserve energy during the heat of the day. This of course means getting out early in the morning to catch the tail end of the night time feeding activity. Casting topwater lures in the shallower areas near grass and shoreline structure is an exciting way to target largemouth bass. As the sun rises in the sky the bass can be expected to find refuge from the heat under thick grass in deeper waters, deep structure or shade under fallen tree tops or docks. When largemouth bass are lounging in these areas it can take some enticing to get them to pick up a bait. Small baits such as stick worms and soft plastics often have to be twitched and allowed to sit right in front of a fish’s face. Largemouth bass tend to be lazy during the heat of the day and pickups will be subtle. Channel catfish offer some peaceful fishing opportunities since they inhabit most all of the tidal rivers. They tend to be holding deep this time of the year and often the best fishing is in the evenings. Fresh cut bait tends to be one of the best and longest lasting baits to use since nightcrawlers tend to attract the attention of everyone from minnows to perch. Blue catfish are in great abundance in the Potomac River and are spreading fast through all of the state’s tidal rivers. The Potomac, Patuxent and Nanticoke rivers have large populations and offer plenty of action and the smaller ones offer fine table fare. Northern snakeheads have spread throughout the Chesapeake Bay system and places like the black water creeks of Dorchester and Somerset counties on the Eastern Shore as well as the tidal Potomac offer plenty of opportunity. Buzzbaits tend to be the best lure to use in the grassy areas. Honorable mention for big fish of the week goes to bowfisher Andrew Tackish with a 47-inch, 13.84-pound gar caught in Charles County. 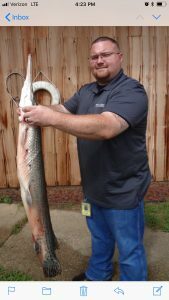 It does not qualify as a state record since it was shot with bow, and is lighter than the rod-and-reel record of 17 pounds. This is still an impressive catch, since it was shot near the surface from a distance of 25 feet. Nice shot, Andrew! Recent windy conditions have tended to put a damper on fishing outside the inlet but surf fishing and back bay fishing has been good. Kingfish are being caught in the mornings on bloodworms or small cut baits in the surf. Small bluefish, spot, flounder and blowfish tend to round out the small specie mix. Sting rays and inshore sharks are present to entertain anyone casting out larger baits in the evenings. At the inlet, sheepshead, triggerfish and tautog are being caught at the south jetty and to a lesser extent at the north jetty. Flounder are always moving through the inlet, and at night striped bass and bluefish are being caught. 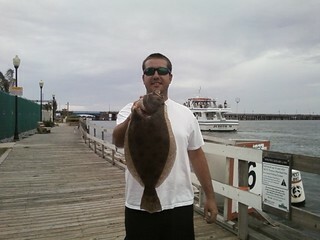 Flounder fishing has been good in the back bay channels, water temperatures have been warm and water clarity good. Traditional squid and minnow baits are catching plenty of flounder, but some of the largest are being caught on white mullet Gulp baits. Outside the inlet, there are still some Spanish mackerel being caught on some of the nearshore shoal areas by trolling silver spoons. 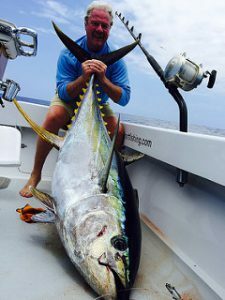 Private recreational anglers need not worry but charter boat captains are reminded that they need to acquire a federal permit if fishing for Spanish or king mackerel farther out than 3 miles. Conditions have been pretty rough outside the inlet, with windy and choppy conditions prevailing through the best part of this week. It has been too rough for most anyone to venture outside the inlet since before the weekend. Before the windy and rough conditions began there was some exciting action, which will be available once the ocean calms down. A few cobia have been showing up on some of the shoals and a couple of nice ones were landed before the weekend. Drifting live eels or sight casting live eels is the most popular way to catch them. The fishing at the wreck and reef sites received a real shot in the arm with the arrival of flounder at the sites. Sea bass fishing has been a bit slow so the opportunity to catch some nice flounder has been putting smiles on everyone’s faces. The flounder will be waiting when the ocean calms down. Before conditions became so rough a nice mix of offshore species were being caught. Chicken dolphin were holding near weed lines and lobster pot buoys out near the canyons. White and blue marlin were being caught along with yellowfin and bigeye tuna. 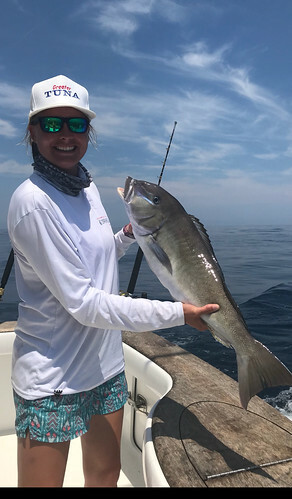 Deep drop fishing has been good for a mix of large sea bass, blueline tilefish and golden tilefish.